. : Optics & Photonics Focus :: Light Syringes :. Solving crimes requires and complicated investigations in order to find clear evidence. Now, it is possible to obtain information about a suspect's travel history by analyzing their hair. An artistic view of a light syringe. Energetic laser pulses may soon become a painless means to administer drugs directly into tissues. No one likes having an injection. The idea of a needle puncturing one’s skin is indeed dreadful. 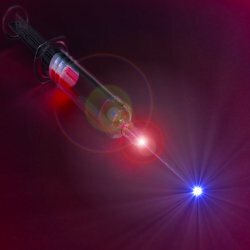 A recent technology, developed by Jack Yoh and colleagues from Seoul National University in South Korea, may soon allow us to replace needles with laser pulses. Some drugs and vaccines need to be carefully injected inside a certain part of the human body. Clearly, a reliable control over the dose, the timing and the place of the application is highly desirable both for the patient’s safety and the treatment success. Even though various techniques have been developed, at the moment nothing seems better than the use of syringes to administer the right dose just where and when it is needed. Unfortunately, the sheer idea of needles tends to scare people away from necessary medical treatments. Can we replace needles with something more comfortable? The biolistic process — a contraction of bio-ballistic — does just that. In a nutshell, drug microparticles are shot into the tissue precisely where they are needed. This does, however, pose the problem of accelerating such a particle to just the right speed so that it can penetrate into the tissue to the desired depth. Unfortunately, the techniques proposed until now [1,2], even though successful in the lab, are not likely to make it to the clinical trials because they use small explosive charges or gases to accelerate the particles. In 2005, Menezes and Takayama proposed a technique to inject microparticles using laser ablation . The particles to be injected are deposited on one side of a thin metallic foil. 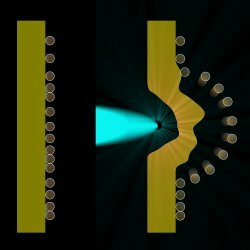 When a focused laser pulse is shot on the other side, some of the metal gets immediately vaporized and transformed into a plasma, which expands supersonically creating a shock wave, similar to the one produced by a supersonic jet. The foil instantly becomes deformed and consequently the particles are ejected at speed as high as 20 000 km/h. At this speed, they can easily penetrate into the human skin without damage or pain. Particle ejection by laser ablation. Microparticles are deposited on a thin metallic foil (left). When a short but energetic laser pulse is focused on one side of the foil, a shock wave propagates supersonically and the particles are ejected at speeds up to 20 000 km/h (right). T. M. Klein, E. D. Wolf, R. Wu, and J. C. Sanford, High-velocity microprojectiles for delivering nucleic acids into living cells, Nature 327, 70–73 (1987). N. J. Quinlan, M. Kendall, B. J. Bellhouse, and R. W. Ainsworth, Investigations of gas and particle dynamics in first generation needle-free drug delivery devices, Shock Waves 10, 395–404 (2001). V. Menezes and K. Takayama, Laser-ablation-assisted microparticle acceleration for drug delivery, Appl. Phys. Lett. 87, 163504 (2005). Tae-hee Han, Ardian B. Gojani & Jack J. Yoh, Biolistic injection of microparticles with high-power Nd:YAG laser, Applied Optics (2010) 49, 3035-3041 (link). Tae-hee Han & Jack J. Yoh, A laser based reusable microjet injector for transdermal drug delivery, Journal of Applied Physics (2010) 107, 103110 (link).